The following post is inspired by my recent purging of glassware from my house. Here is a beer nerd crash course in glassware. The road to Cicerone is fraught with the accidental accumulation of beer drinking vessels. It starts off innocent enough: you buy a branded pint glass from your favorite brewery or two. Maybe you go to a local Oktoberfest and find they have Hofbrauhaus liter steins there so you spring for one of those. Next thing you know you are building display shelving for your massive collection of pint glasses from every brewery on the west coast and placing orders with friends visiting other states. You’ve got a stein from every brewery in Bavaria and are patiently awaiting the “Boot” you bought on some sketchy import site. Your friends know you have a problem, but you’ve become so easy to buy gifts for they willfully play into it. 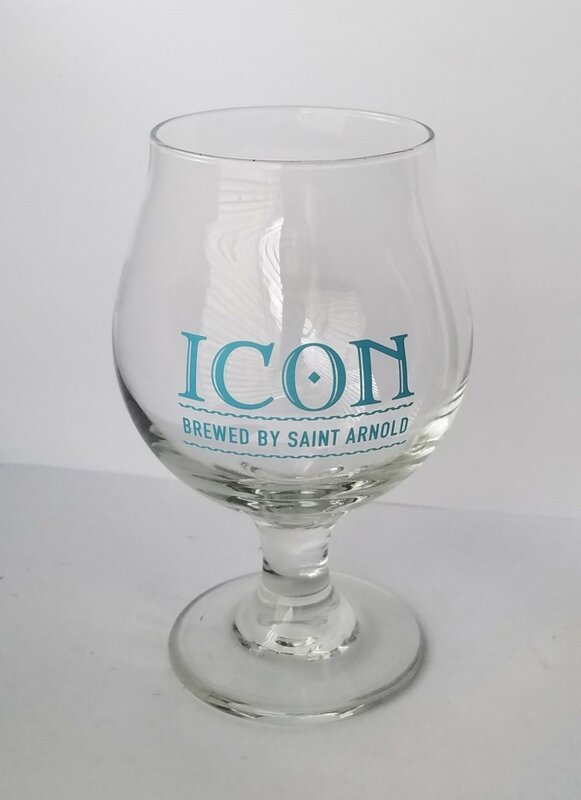 Wait, branded glassware from Belgium? You mean I need to have the proper glassware from each brewery or else the Belgians will scoff at me? Better get out the credit card. Next thing you know you are sitting in a house built out of specialty glassware but all you want to do is drink a PBR straight from a can. Is the above story relatable? I hope not. I’ve always been a fan of drinking beer out of the proper glassware. Not because I think it actually does much to improve real physical qualities of the beer (as they claim), but because it enhances the experience to know you are tapping into the unseen history of the beer, nerding out a little, and “doing it right.” This post is partly for the would-be beer nerds out there who have been doing it wrong and also for the normal beer drinkers out there who couldn’t care less what their beer came in but are nevertheless intrigued by fun facts. When possible, I used photos of glassware from my own collection. You’ll see that was possible in almost every case. I’m not proud to be proud of that. It’s the classic pint glass. If you drink beer in the US, you probably drink it exclusively from this guy. It’s called a shaker because it used to be paired with a stainless steel cup of roughly the same shape for shaking and pouring cocktails. Its original purpose had nothing to do with serving beer, but around the 80’s people starting using it for that anyway. It’s a terrible cup, and I am not sure what that says about Americans since we are the only people who use them for beer. It doesn’t do anything. It’s slightly angled sides make it a chore to hold on to. When filled to the absolute brim, it holds 16 oz, which means if there is a nanometer of head you are getting shorted on your pint. Your cabinet is probably full to the brim with them because every brewery pops out a branded version and you are compulsive hoarder which is your prerogative as an American. Ideally, the goal of glassware is to enhance to beer drinking experience. The glass should show off the color of the beer and play with the light to make it look better. It should control the head of the beer allowing it to grow up and become tall or restricting it to make it grow dense. You want to hold the aroma in so you can get a nice full nose of it every time you drink. It also ought to be easy to hold. Apart from that last bit, I don’t think that any of that other stuff really matters. Even if you had the perfect glassware for the beer you were drinking and had meticulously controlled every aspect of the glass to enhance the beer’s aroma, head, and color, you could blow that whole experience out of the water just by drinking the same beer out of a plain plastic cup while sitting in a hot tub. It’s worth mentioning that is doesn’t matter how you enjoy your beer. I have a buddy who would drink sour beers out of a martini glass with a straw. If that’s how you like it, then go ahead by all means and don’t let any excitable beer folk tell you you’re wrong. Ok, moving on. These are the perfect glassware in my opinion. Massive, heavy, and beautiful. They test your arm strength as well as your alcohol tolerance. Their handle makes them easy to hold and their lense shaped glass literally magnifies the sight of the beer. They come in two sizes: half-liter and full liter, but importantly they are actually about 20% larger than that to account for headspace. If you get a seidel filled to the brim with wet beer then you got more than you asked for, though you were shorted on the precious head. Though it’s not usually necessary, some good head is always a great bonus. Here in the States, they are normally only found only in German style restaurants and Oktoberfest celebrations, but in Bavaria (Southern Germany, FYI) they are ubiquitous, especially during Oktoberfest. This is the real reason I started writing this post. I was giving away lots of “steins” that I had collected from various Oktoberfest celebrations, but I knew that if anyone was paying too close attention they would notice I was indeed not giving away any steins. I was actually giving out seidels. I call seidels “steins.” Everyone does. However, if you want to get technical, steins have lids. That’s their thing. If it doesn’t have a lid it is either a broken stein or not a stein. I mean, if you want to get really technical, the word “stein” has a long history, so you could track down whatever definition of “stein” you want. The entry for “stein” on Wikipedia, for example, has a very non-lidded stein right up top completely contradicting what I just said, so in the true American spirit, if we can add a new meaning of “literally” to the dictionary, then we can call literally anything a stein. I say go ahead and call it a stein even if it is a seidel because that is what I do. Stein Stein Stein. You’ll never guess why they call it a nonic pint. 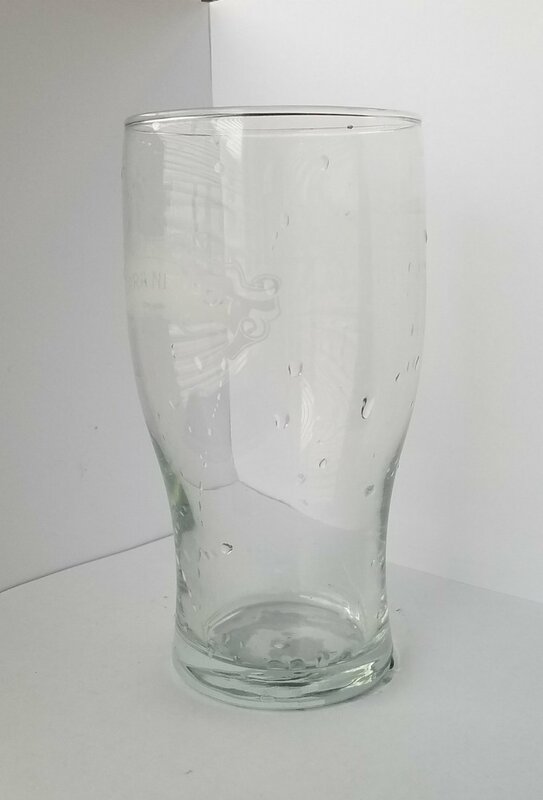 It’s just a variation of the normal pint glass, but the bulge about an inch below the rim gives the glass some structural stability that helps prevent chipping or as the British apparently say, “nicking.” Hence no-nick pint. Geniuses over there. The bulge does indeed keep the pint from smashing itself to pieces if it tips over on the table and it gives your hand a nice little grip. Apparently, it also helps prevent chips when stacking though I can’t quite see how that works. If anyone reading this has the necessary coursework in statics or materials or whatever to explain why that is, please comment. Anyway, it’s a big improvement on the American version even if it is a little hard to print on. The one I have is ever so slightly larger than 16 oz meaning there is built in room for error on the head. That does it for all my favorites. We now tread onto the more esoteric and dare I say, pointless types of glassware. The kind where, in my opinion, despite their intriguing history, every attempt to explain why they are shaped like they are is an attempt to back-splain a decision made so long ago no one cares why they did it. The short version is that because of tradition, beer preferences, and glassmaking techniques, people made big glasses to drink lots of beer or they made small glasses to drink less beer. Every glass has some benefits or drawbacks, but you’d think they would have designed the perfect glass by now. You might recognize the shape from every Guinness you have ever had. It’s larger than normal pints and it is slightly tulip shaped (the way the glass curves in at the top, in this case not very much at all) which allegedly was done to help showcase the head of the beer and keep in aromas. I like it because it is big and usually has beer in it. Drying glasses is apparently not my style. Even less my style is retaking photos I am not satisfied with. The snifter is for fancy people. If you get a beer in one of these, you probably should sip it carefully. Usually smaller than a pint, they are reserved for stronger sipping beers like imperial stouts and barleywines. The stem keeps your hand warmth away from the beer and the tulip shape helps you slow down, stick your nose in, and appreciate the delicate or intense aromas of the special beer contained within. In a hilarious turn of events, some breweries have full pint-sized snifters for holding their normal beers. I’ll gladly drink a blonde from a giant snifter but I do so ironically. The look a lot like snifters. They have stems, but the rim flys way out like a blooming flower. Remember above when I called out the British tulip pint? This is a totally different type of tulip. It’s still called the same thing and extremely confusing. Fun fact, the Belgians totally do that knife thing they do in the Stella Artois commercial where they scrape the top layer of foam off. It scrapes off the first few bubbles of foam from the top of the head which are bigger and angrier due to how they were sitting comfortably in the warm end of the tap until just seconds before leaving you with uniform, cold, and delicious head. A little more tuliping out and you have a real tulip. Tulip a little less and you have a proper snifter. This is one of the full pint sized ones. 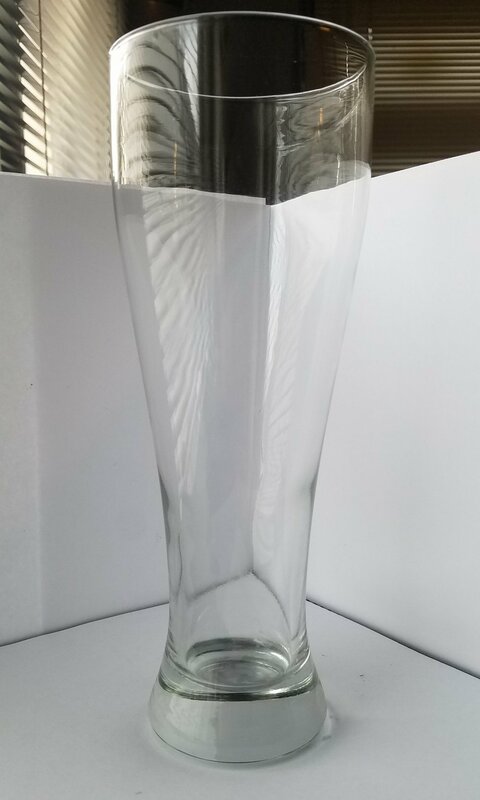 The pilsner glass’ main characteristic is that it is tall. Very tall. Made for holding a large amount of head. The extreme taper of the glass gives the head tons of room to expand thus making it very tall and light, just way they like it. It also has a base on the bottom, but despite that, it is still pretty top heavy and prone to tipping. The glass is extremely thin to show off what is supposed to be the clearest and cleanest of all beers. If you are trying to decorate your Art-Deco 1930’s home, then you should have several of these. The weissbier glass is basically the same thing but with a much more show-offy shape. It subs in the thick, heavy base we’re used to for the wide base of the pilsner glass. The tall form is meant to hold a lot of head and at the last minute the glass tulips in to condense the head into a thicker foam. These two glasses are my favorite example of form before function. They are so top heavy they are basically a disaster waiting to happen. They both have the same purpose: to showcase heady beers, and they both, hilariously, have completely different ways of trying to accomplish that, both with the same amazing drawback. You might as well drink out of an American Shaker and save yourself the mopping you’ll probably have to do. A more modest glass for a modest gentledrinker. It’s short, has a handle, and has lensed dimples like the seidel. It doesn’t suffer from any top-heaviness. Its thick, round, bowl-like shape makes it almost impossible to break. If I were combining traits to make the perfect glass, I’d almost be there with this. It’s a wonder why they aren’t more popular here. If only they were a little bigger, they could be super popular in Germany. I think that does it. Yowza, that got long. If you made it this far then you know about as much about glassware as any sane person needs to know. For all the fun in this, it really isn’t that important. Drink and enjoy beer however you want, though I will point out here that drinking directly out of a can or bottle is a great way to short yourself on some of the pleasure of a beer. So whatever glassware you pick, enjoy yourself! Thanks for reading! Many of the facts presented here come from Randy Mosher’s Tasting Beer which is an awesome read. If you want to know more about beer then pick it up, though if you want to know more about glassware, you ought to find some other source because I picked that one pretty clean.